In a small bowl, combine the chili powder, cumin, salt and pepper. Sprinkle the spice mixture evenly over the pork cutlets. In a large nonstick skillet over high heat, warm 1 T of the oil until hot but not smoking. Add the pork and cook until browned on both sides and cooked through, about 8 minutes. 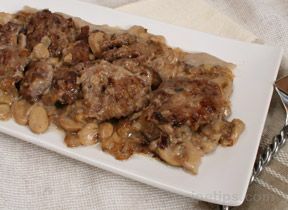 Transfer the cutlets to a plate and cover loosely to keep warm. Halve the pears lengthwise, then cut each half into 1/2 inch wedges. Core the wedges. In a small bowl, blend the chicken broth and cornstarch. Add the remaining 1 tsp oil to the skillet and reduce the heat to medium. Add the pears and sauté for 1 minute, tossing with a spatula to coat with the pan juices. Add the broth mixture, spreadable fruit, and lemon juice to the skillet and bring to a simmer. Cook, turning the fruit frequently, until the pears are tender and the sauce is thickened, 3 to 4 minutes. Pour any meat juices that have collected on the plate into the skillet and simmer for 1 minutes longer. 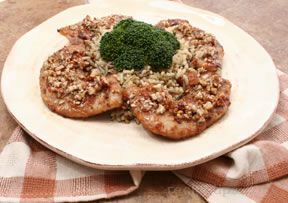 Serve the pork cutlets topped with the pears and sauce. A Weight Watcher recipe.